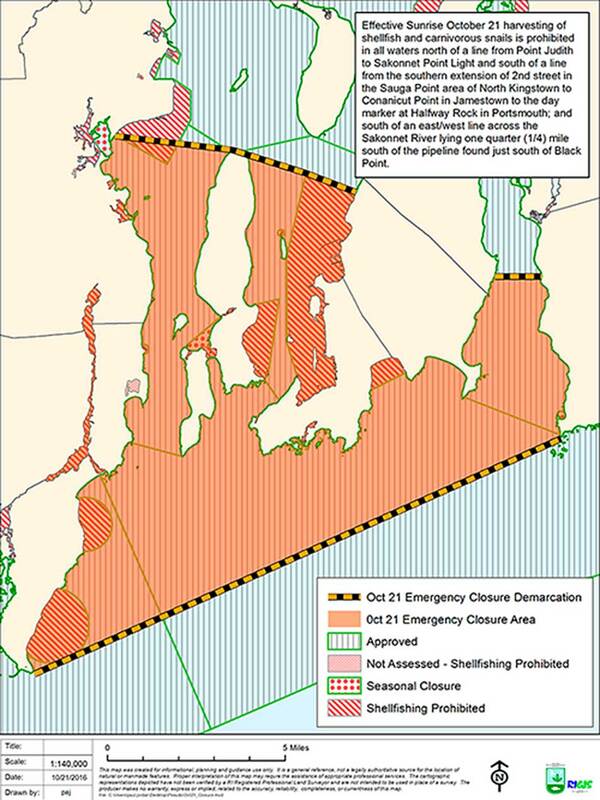 Rhode Island Department of Environmental Management: Interactive shellfish area closure map. Effective at sunrise on May 27, 2017, the RI Department of Environmental Management (RIDEM) announced that it would modify some of the shellfish harvesting restrictions in upper Narragansett Bay and completely lift one restriction that had been in place for 70 years. Removing and/or modifying conditional closures in upper Narragansett Bay was made possible, in large part, by the completion of phases I and II of the Narragansett Bay Commission’s combined sewer overflow (CSO) abatement project. This infrastructure investment to reduce untreated wastewater from entering the bay during high precipitation events has led to improvements in water quality throughout the lower Providence River and upper Narragansett Bay. The area previously identified as Conditional Area B, shown in green stripes, just north of the tip of Prudence Island, is now approved. Conditional Area A, marked in yellow grid in Upper Narragansett Bay, has been redefined with different closure conditions. 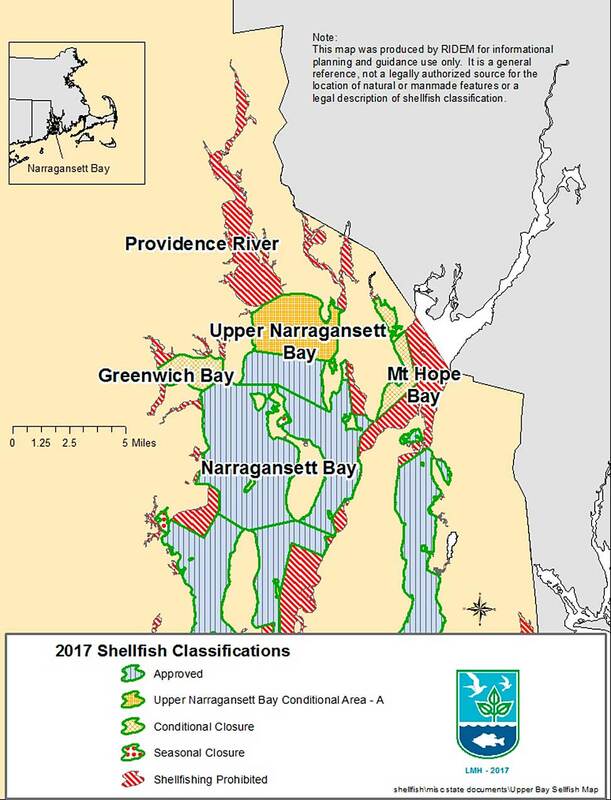 As part of the reclassification of shellfishing waters, Conditional Area B—3,712 acres in the upper bay, just north of Prudence Island—changed to approved status. Additionally, two other conditional areas were combined and the closure conditions were revised. The new Conditional Area A, located in the northern part of upper Narragansett Bay, will close after 1.2 inches of rain where they previously closed after 0.5 to 0.8 inches of rain. This means that these shellfishing areas will remain open more days out of the year. It is anticipated that more changes may be forthcoming. Water quality monitoring and shellfish tissue data show that the lower portion of the Providence River holds potential as a new conditional area; shellfishing in the river has been prohibited for more than 70 years. RIDEM and its partners will develop a management plan for the area before it is opened to shellfishing to ensure the long-term sustainability of the shellfish stock. This work is continuing into 2018. Despite recent improvements, shellfishing remains prohibited in many areas of Narragansett Bay where it has been historically popular. These areas continue to be impacted by harmful bacteria sources such as cesspools or improperly functioning septic systems; waste from domestic animals, waterfowl, and wildlife; and stormwater collection systems and illegal connections of wastewater to stormwater systems. Progress is being made to control these sources, but more work is needed to reopen recreational shellfish areas. Harmful algae are present in Rhode Island waters year-round, in numbers that typically do not pose a human health concern. Routine monitoring is conducted approximately twice a week from May to September to test for phytoplankton blooms that elevate the risk for biotoxin production and human health impacts. This routine monitoring detected elevated Pseudo-nitzschia cells off Newport Harbor in late September 2016. Pseudo-nitzschia are capable of producing the biotoxin domoic acid, though they do not always produce it and research has not yet shown exactly what triggers its production. Consumption of shellfish with unsafe levels of domoic acid can lead to Amnesiac Shellfish Poisoning, which can cause nausea, vomiting, diarrhea, and abdominal cramps in mild cases, and neurological symptoms like headaches, hallucinations, and short-term memory loss in severe cases. The detection of Pseudo-nitzschia in September led to more intensive monitoring and the enactment of a baywide precautionary shellfish harvesting closure on October 7, 2016, which remained in place until October 15 of the same year. Maine and Massachusetts also detected Pseudo-nitzschia in their shellfish growing areas and instituted similar closures around this time period. Over the course of the following several weeks, the RIDEM undertook an intensive phytoplankton sampling and shellfish meats collection program, analyzing 176 plankton samples and 57 shellfish samples. The results of these surveys in the second week of October showed improving conditions with declining Pseudo-nitschia cell counts and absence of domoic acid. On October 15, 2016, all waters impacted by the harmful algal bloom (HAB) were reopened to shellfishing. Given the potential seriousness of this toxin, an overabundance of care was warranted. Another round of closures in the lower Narragansett Bay started on October 20, 2016, after elevated phytoplankton cell counts and positive domoic acid results in plankton and shellfish were detected off of Sakonnet Point. Further sampling found similar conditions at Fort Wetherill in the East Passage, and elevated cell counts in the West Passage, which resulted in the closure being extended across the lower bay and a portion of Rhode Island Sound. As quickly as the cell counts had risen, they declined and the waters were re-opened to shellfishing on October 29, 2016. This was the first ever shellfish closure in Rhode Island due to harmful algal blooms. There were no recalls required and no incidences of illness reported. This event illustrates the effectiveness of the monitoring protocol in protecting human health and ensuring the integrity of Rhode Island’s shellfishing industry, while limiting the impact of an extended closure on the economy. More information regarding the 2016 HAB.